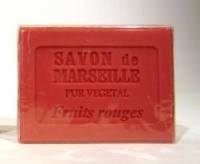 Marseille soap or Savon de Marseille is a traditional soap made from vegetable oils that has been made around Marseille, France for about 600 years, the first documented soapmaker in the area being recorded in about 1370. 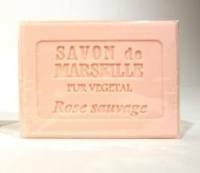 By 1688, Louis XIV introduced regulations limiting the use of the name savon de Marseille to soaps made in and around the Marseille area, and only from olive oil. Today this law still applies, although the regulations now allow other vegetable oils to be used. 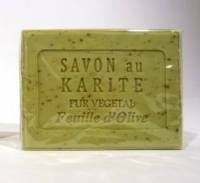 Traditionally, the soap is made by mixing sea water from the Mediterranean Sea, olive oil, and the alkaline chemicals soda ash and lye together in a large cauldron This mixture is then heated for several days, stirred constantly. The mixture is then allowed to sit and, once ready, it is poured into the mold, and allowed to set slightly. 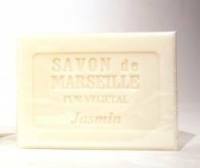 Whilst still soft, it is cut into bars and stamped, and left to completely harden. 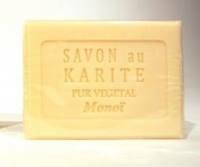 The whole process can take up to a month from the start before the soap is ready to use. 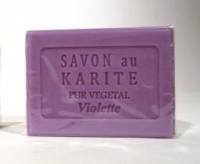 Today, there are two main varieties of this soap. The first is made with olive oil; the second with Palm oil or a palm and copra oil mixture, but by the same process. The olive oil variety is green and the palm oil variety is white in colour.